You can browse our Services without telling us who you are or revealing any personal information including but not limited to your name, email address, phone number, mobile telephone number, debit or credit card information or physical contact information about yourself. If you create an account or purchase any of our products or Services, you choose to give us your personal information and are not anonymous to us. When you create an account or use certain of our Services or otherwise engage with our Services, you may provide certain additional information such as username. You may also provide payment information such as credit or debit card information, name and billing address. Information to Respond to Your Requests. You may give us your personal information so we can send you communications you request. Details of how you can opt-out of receiving any promotional communications from us are detailed in the section headed Choice and Opt-out. Any information or content you post when participating with the Services, Social Networks, plug ins or other applications becomes public information, depending upon your privacy settings, and is subject to redistribution by Keranique and other third parties. There is no expectation of privacy when posting content or otherwise participating in interactive forums and we have no control over how those users may use the information you make public. Therefore, you should exercise caution and discretion when deciding to disclose your personal information in a submission or posting. We may collect additional information from you if you access Services through a mobile device, for example your unique device identifier, device operating system, mobile carrier, location or GPS/geo-location, and billing information which we may collect when you opt in for us to do so. When you use our Services we may request your permission to collect your location information. Please be advised some features will not be available if you choose not to provide your location data to us. However the degree to which your location can be identified depends on the device you are using (e.g. laptop, smartphone, tablet) and how you are connected to the internet (e.g. via cable broadband connection, Wi-Fi, etc.). If you enable location services for our Services we may collect location data periodically as you use or leave open our Services. We may also use this data internally or in conjunction with our third party service providers to customize your experience and provide offers that may be relevant to you. Depending on the platform you use to access our Services (e.g., Apple, iOS, Google, Android, Windows, etc.) you may be able to control from within the settings on your wireless device or the Service(s) whether location data is collected. From time to time you may choose to submit personal information about other people to invite them to share content on or use our Services. Inviting friends is always optional. Please be aware that when you use any send-to-a-friend functionality on the Services, your e-mail address may be included in the communication sent to your friend. The information we collect may be combined with information from outside records (e.g., demographic information, navigation information, additional contact information) that we have acquired in accordance with the law. We use this information to help us maintain the accuracy of the information we collect, to customize our communications so that we can inform you of products, services and offers that might be of interest and for internal business analysis or other business purposes. We use aggregate information about our users and non-personal information to analyze the Services and user behavior and prepare aggregated reports which we share with third parties. Communicate With You and Third Parties at Your Request. We use your information to contact you to maintain your account, to comply with your stated communication preferences and to provide other Services requested by you, as described at the time when we collect the information from you, or to contact you for other purposes authorized by law. We may also use your email address or mobile phone number to send you updates and communications about our products and services or other messages, such as newsletters, text messages, changes to features of the Services, or special offers. You will be given the opportunity, in any promotional email or text message that we send to you to opt out of receiving such messages in the future. To see your choice and opt-out options, click here. Sale or Transfer Of Business Or Assets. If Keranique or any of its brands or divisions is sold or disposed of as a going concern, whether by merger, sale of assets or otherwise, or in the event of an insolvency, bankruptcy or receivership, personal information of our users may be one of the assets sold or merged in connection with that transaction. Information about our users may also need to be disclosed in connection with a commercial transaction where we or any one of our businesses are seeking financing, investment, support or funding.
. Account holders can review and change personal information at any time by accessing their accounts on the Services. If for any reason you are concerned that the personal information you provided to us is not correct and you cannot change it by accessing your account contact us_support@keranique.com. You should promptly update your account information if it changes or becomes inaccurate. If you have an account you may close that account at any time. Please email support@keranique.com or call 1-888-237-4131 for information on how to close your account. We may retain some information from closed accounts so that we can comply with law, prevent fraud, assist with investigations, resolve disputes, analyze or troubleshoot programs, enforce our Terms of Service, or take other actions permitted by law. Likewise if your account is terminated or suspended, we may maintain some information to prevent re-registration. If for any reason you are concerned that the personal information you provided to us is not correct contact us at support@keranique.com or call 1-888-237-4131. You should promptly update your personal information if it changes or becomes inaccurate. Opting Out Of Promotional Messages. Information that you disclose while participating in the Services may be public and subject to redistribution by us and any third-party that reviews your Social Network profile or information that you post. Please be aware that Keranique is not responsible for the uses or copies of your public postings on or through Services which are downloaded by third parties. To change your privacy settings please contact us. You may not opt-out of administrative e-mails (for example e-mails about your transactions or policy changes) for your registered account. Deactivation Or Deletion Of Your User Content/Account. You may request that we deactivate or delete your account by contacting us. You may also e-mail us at support@keranique.com. When you deactivate your account or ask that we delete your content on a Service we will retain logs and information about you along with an archival copy of your information, which is not accessible by you or third parties on the Service but which might be used by us for recordkeeping and internal purposes, including enforcing our Terms of Service and demographic, reporting and research purposes. We will endeavor to comply with your requests as soon as reasonably possible but please note that changes requested of us may not be effective immediately. Unless required by law, we are not responsible for informing third parties with whom we have already shared your information of any changes requested pursuant to this section, or for removing information from or causing information to be removed from the databases or records of such entities. When you provide us with information in connection with a particular activity or otherwise sign up for our Services or provide your contact information, including an email address or telephone number in connection with that activity, product or Service, you agree that this action constitutes a purchase or inquiry establishing a business relationship with us. You expressly consent to our communicating with you future information about our Services using the information you provided to us. You also attest that you have the legal authority over any telephone number you provide to us and can provide us with the authorization to contact you. This means we may contact you, in person or by recorded message, by e-mail, telephone and/or mobile telephone number (including use of automated dialing equipment), text (SMS) message, or any other means of communication that your wireless or other telecommunications device may be capable of receiving, in accordance with law. We implement security measures to protect against the loss, misuse and alteration of information under our control, including to protect your data. SSL is encryption technology that helps safeguard your personally identifiable information against misuse by unauthorized individuals. However, despite our efforts, no system can completely guaranty that there will never be unauthorized access to your personal information, and your use of the Services indicates that you are willing to assume this risk. We do not represent or warrant that any of our Services is appropriate or available for use in any particular jurisdiction. Those who choose to access the Services do so on their own initiative and at their own risk, and are responsible for complying with all local laws, rules and regulations. We may limit access to our Services, in whole or in part, to any person, geographic area or jurisdiction we choose, at any time and in our sole discretion. By using our Services and submitting any personal information, you consent to the transfer of personal information to other countries, such as the United States, which may provide a level of data security different from your country of residence. You are also consenting to the application of United States law in all matters concerning the Services. California Civil Code Section 1798.83, known as the "Shine The Light" law, permits our customer-services who are California residents to request and obtain from us a list of what personal information (if any) we disclosed to third parties for direct marketing purposes in the preceding calendar year and the names and addresses of those third parties. Requests may be made only once a year and are free of charge. To make such a request, please contact us. For all requests, you must put the statement "Your California Privacy Rights" in the body of your request, as well as your name, street address, city, state, and zip code. In the body of your request, please provide enough information for us to determine if this applies to you. You need to attest to the fact that you are a California resident and provide a current California address for our response. Please note that we will not accept requests via the telephone, mail, or by facsimile, and we are not responsible for notices that are not labeled or sent properly, or that do not have complete information. Copyright © 2019, Keranique, LLC. All rights reserved. To provide web site visitors more choice on how their data is collected by Google Analytics, Google has developed an Opt-out Browser add-on, which is available by visiting Google Analytics Opt-out Browser Add-on, at https://tools.google.com/dlpage/gaoptout/ to enable you to opt-out of Google’s programs. In particular, we use Google AdWords Remarketing to advertise Keranique across the Internet, in particular on the Google Display Network. • AdWords remarketing will display ads to you based on what parts of the Keranique website you have viewed by placing a cookie on your web browser. • This cookie does not in any way identify you or give access to your computer or mobile device. • The cookie is used to indicate to other websites that "This person visited a particular page, so show them ads relating to that page." • Google AdWords Remarketing allows us to tailor our marketing to better suit your needs and only display ads that are relevant to you. Web Beacons/GIFS. Small graphic images or other web programming code called web beacons (also known as "1×1 GIFs"; or "clear GIFs";) may be included in our web pages and messages. Web beacons may be invisible to you, but any electronic image or other web programming code inserted into a web page or e-mail can act as a web beacon. Web beacons or similar technologies may be used for a number of purposes, including, without limitation, to count visitors to our Services, to monitor how users navigate the Services, to count how many e-mails that were sent were actually opened or to count how many particular articles or links were actually viewed. HTML5. We use HTML5 in some of our applications, including in our mobile website for the iPhone or iPad. HTML5 has browser web storage that does not rely on traditional browser cookies. Like Flash cookies, HTML5 cookies are not stored in a browser "cookies"; file and, like Flash cookies, can be used to track users across websites. To our knowledge there is currently no known way for a user of a mobile device to remove HTML5 tracking and storage. 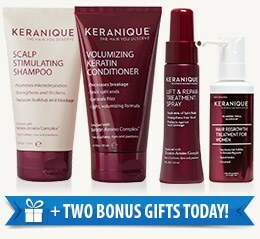 Keranique® Hair Regrowth System is CLINICALLY PROVEN and designed for women’s unique hair needs. We know you’ll love it, but if for any reason you're not completely satisfied, just call within 120 days of receipt, return the product as instructed, and you'll get a FULL REFUND of the purchase price (less s&p), even if the products are empty. Click ORDER NOW to take advantage of our Special TV Offer!